Driving from San Francisco to Half Moon Bay on the Pacific Coast Highway is a lot like driving along any small town highway; chain restaurants and motels litter the sides of the road. The only difference is, these “motels” look a lot nicer than the Motel 6s and Super 8s that usually line a highway. It’s almost as if someone gave this portion of the PCH a facelift. Of course, just like any facelift, there are some signs of what’s below the surface of recently remodeled hotels. Right before reaching the Beach House at Half Moon Bay, you’ll see one of those spots that show Half Moon Bay’s down-to-earth side, Sam’s Chowder House. The sight of this boisterous and big seafood restaurant on the beach will make you fear what lies ahead (unless you like overweight people with lobster bibs yelling over really loud music). Luckily, the building almost directly next door, the Beach House, is a quiet juxtaposition. You know how they say don’t judge a book by its cover? The same can be said for hotels and the destinations they call home. Plopped right on the ocean off the PCH in between Sam’s Chowder House and a trailer park, the Beach House at Half Moon Bay is a little out of place. From the road, it sticks out like a sore thumb with its taupe exterior, peaked roofs, and chimneys coming together to create an all-American town-home look. Like all motels, and George Costanza, it’s wide but short with only three levels. Try to ignore the hooting and hollering from Sam’s (or is that coming from the trailer park?) and let the hotel transport you to a calm Oceanside oasis as you walk under the long covered walkway with strung lights that takes you to the lobby. As you get closer, you’ll notice that the designers really wanted to give this hotel a homey feel, which is why rooms feature arched windows with window boxes full of flowers. The cozy feeling is amplified in the lobby, which has a peaked wood ceiling with skylights, a fireplace directly in front of the entrance, and plush seating. We highly recommend enjoying their complimentary breakfast from the breakfast nook with bright blue seating that could have been plucked right out of your childhood home. A beach theme takes you further from the trailer park, thanks to framed shells (more about those later), photos/paintings of the ocean, and a model sailboat sitting next to the stone fireplace. Oh and in case the wood ceiling and fireplace made you feel like you were at a ski lodge, the carved shell on the top of the mantle will put you in your place. The hotel consists of 54 junior suites. They are all the same size, 450 sq. ft., and follow a studio-like floor plan, with a living room and sleeping area, making these accommodations good for small groups. Each room has a patio or balcony, a fireplace, two flat screen TVs, a refrigerator, and complimentary Wi-Fi. And the best part is that 80 percent of their rooms feature ocean and sprawling coastal views. You’re sure to be impressed by how dedicated the hotel is to proving they are nothing like their neighbors. Their mission is to put you on a calm beach, and they will stop at nothing to do so. For example, the hotel room binders that explain how everything works and how to order room service also have a few pages dedicated to the artwork featured throughout the hotel. One page explains that the antique fish prints are from three of the most important studies done of the species during the 19th and very early 20th centuries. They go on to explain those three studies. The next page is devoted to the shells; it explains that the Royal Dutch Shell Company (yes, where you got gas down the road) made the shell prints in Germany in 1956 and how the hotel acquired them. To my inner nerd’s delight, I sat there reading these pages for about 10 minutes, in awe that essentially a super fancy motel would go to all this trouble just to give guests some background info on this art they might not have even noticed. I will never forget the hotel that taught me about shells. All jokes aside, you’ll forget all about the neighbors when you’re inside the building. But, if you’re looking for a wild night out, check out Sam’s. Otherwise, stick to the hotel’s small strip of beach, heated outdoor hot tub and pool, and direct access to the seven-mile-long Coastal Trail. 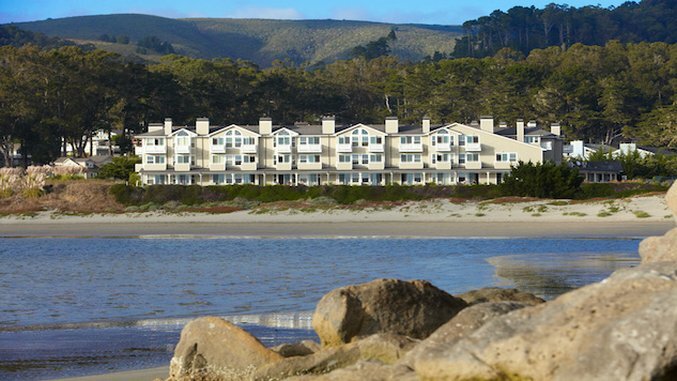 You’re five miles from Half Moon Bay’s downtown where you’ll find small-town-style restaurants and shops.